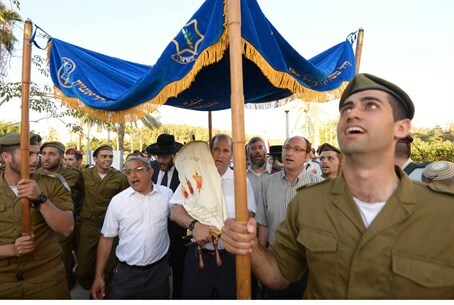 The IDF's Paratroopers' training base in Shumriya received a sefer Torah (Torah scroll - ed.) on Monday evening, in a moving ceremony attended by the families of murdered teenagers Eyal Yifrah, Gilad Sha'ar, and Naftali Frankel, as well as Prime Minister Binyamin Netanyahu's wife Sara. The Torah scroll was written in the memories of the three boys, in a project funded by anonymous donors. The families specifically requested that the scroll be donated to this training base, in gratitude for the efforts the unity took to find their sons during last summer's Operation Brothers' Keeper. While Netanyahu himself was unable to attend the event, he penned a heartfelt letter in its honor. "In the months since Operation Brothers' Keeper to return the boys who were abducted and murdered by villains, we have not forgotten your spirit and faith," he said. "Thanks to your standing firm and your deeply noble conduct [in the weeks which follows - ed. ], the nation united, and both Israeli and Diaspora Jews rallied in hope, prayer - and pain." "The bright characters of your sons will stay with us forever," he continued. " They will serve as a symbol of love for humanity, the nation and the country." Sara Netanyahu told the families, "You entered my heart. You entered the heart of Israel." "You show mental strength, strong faith and awe-inspiring strength," she added.